Time flies. You sleep when you are sleepy and don’t pay attention to what time it is. You get up, you stretch, and check on the weather outside. On a sunny morning, the early sky glows golden, but cloudy days are also fine. Next comes breakfast. How strange that one can grow to love something so rich in fat. After lunch you go out without a certain plan to get back (on time). Even when you enter the fog, everything is all right. Time has stopped, and it harmonizes the gene that makes one a seeker. Here, everything happens in conformity with the principles of experience and sharing. You’re given the transport you need and are protected from the polar bear. There’s no internet connection or phone coverage. There is a place where the glacier reflects back the phone signal and thus your chance at communication. But there’s always the satellite phone in case something (bad) happens. Every day a tourist boat or two arrive, and for an hour or an hour and a half, the town is full of people who enjoy a cup of instant coffee, Russian chocolate and home-made pastries. Then, silence sets in. There are just the deserted houses, rustling interiors, and a sense of timelessness, surrounded by (almost) nobody. Everybody who has ever been to Pyramiden has had a glimpse of a secret nobody else has an idea about. “It impresses you, it shows up in your dreams a lot,” “Here you lose your fear of people”, “While you are here, the rest of the world is put on hold” – that’s what they say. The ex-Soviet mining town Pyramiden on the archipelago of Svalbard was deserted in 1998, leaving behind a library full of books, a culture center, and a grand piano that must be the northernmost in the world. Historically a no-man’s land, or, to be more precise, everyone’s/anyone’s land, it has been used commercially for its natural resources, i.e. coal and other minerals. Due to the accessibility of the place it has become a favorite for researchers from all over the world. 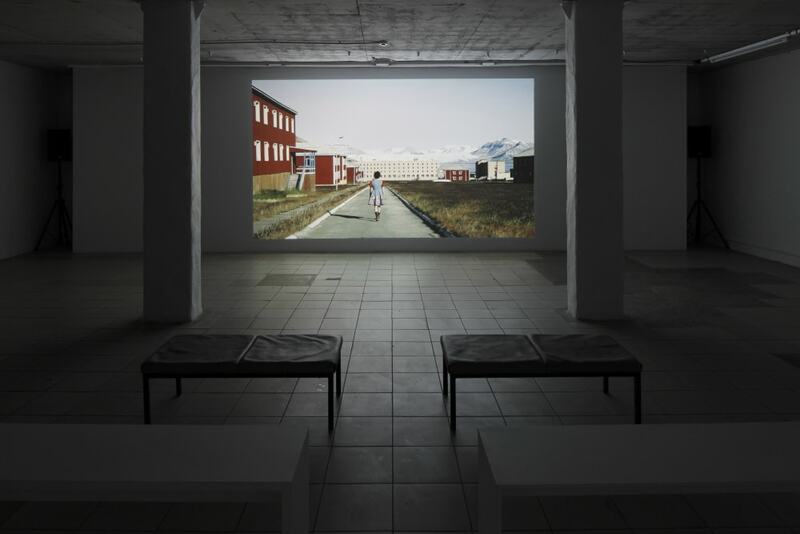 A No-Man’s Land, An Everyman’s Land is Ieva Epnere’s solo show that comprises cherished memories from her journey to this ‘end of the world’. It is a souvenir of the desire for something unknown, the dictates of nature, and the circles of human psychology. By sharing what she has experienced in the embrace of exile-solitude-mastery, whether personally or indirectly, learning from somebody else or from the historical experience, Epnere has created a new setting for this exhibition where views and data, obtained thanks to sometimes incredible coincidences, are on display. By revealing and floating, breaking and getting things to move a completely new situation is created where the human being she knows but does not individualize is the protagonist. The exhibition space features two structures, similar in form to the tents the first arctic explorers used in their fieldwork in early 20th century. One of the structures is projective, protecting from exposure material that combines motion and fixed pictures. There four pyramidians share stories, both sentimental and humorous, about their desire to go “to the end of the world”. The other symbolical tent is an inward-facing structure that leads the viewer into a space where a sequence of images has been captured through the eye of a static camera tracing a walking woman wearing a dress. This motion picture is a meditative move towards the horizon and is permeated with personal memories and experience of the artist behind the lens and her visible companion of this performance, thus conveying the story of the fascinating, the symbolic and the sad in the wordless silence. 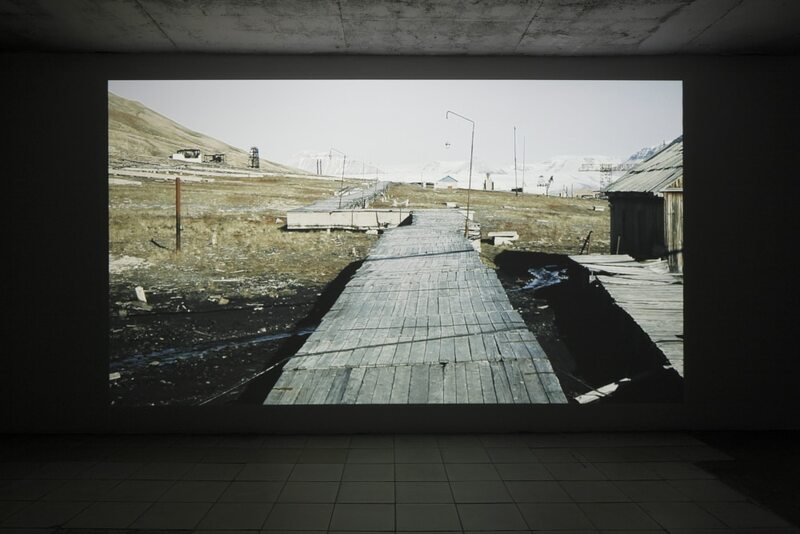 The end of the walk is its beginning – captured from behind the shoulder of the woman, a painted landscape of Pyramiden opens up, similar to the five frames stilled by presence in the first exhibition room. Ieva Epnere (1977) lives and works in Riga. Her work includes photography, video, and film in which personal and private stories become the starting point for artistic reflections on identity, tradition, and ritual. Recent solo shows include: Waiting Room, Contretype, Brussels (2015); Galerie des Hospices, Canet-en-Roussillon, France (2014); Mindscapes, kim? 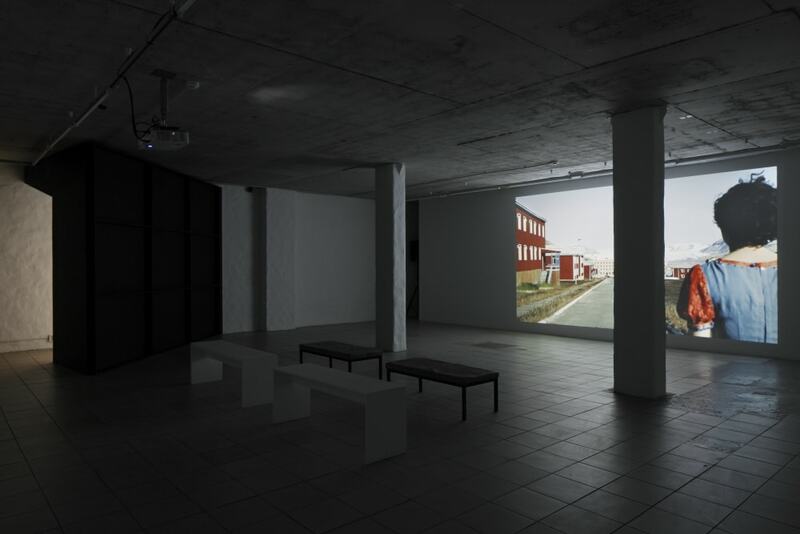 Contemporary Art Centre, Riga, Latvia (2013); The Green Land, kim? 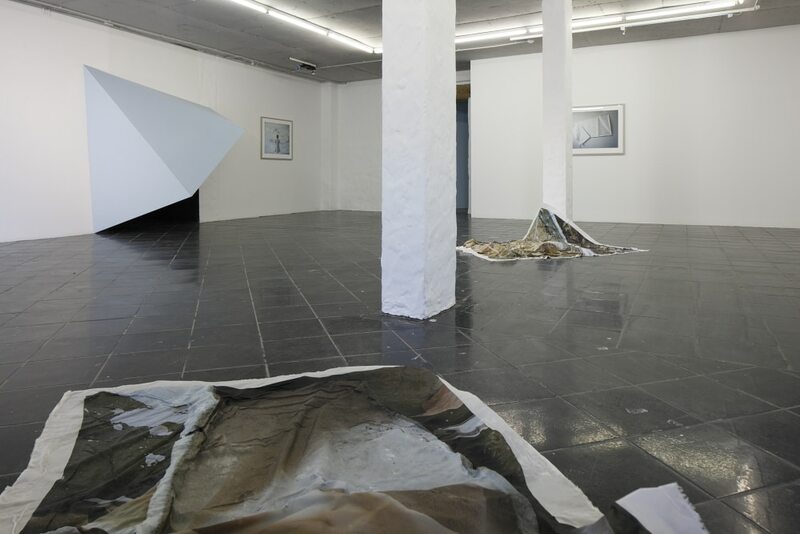 Contemporary Art Centre, Riga, Latvia (2010); Darbi, Kulturforum Alte Post, Neuss, Germany (2009); Mikrorajons, The exhibition hall Arsenals, Riga, Latvia (2007); Encounters, Atelier Hoeherweg, Dusseldorf, Germany (2006). 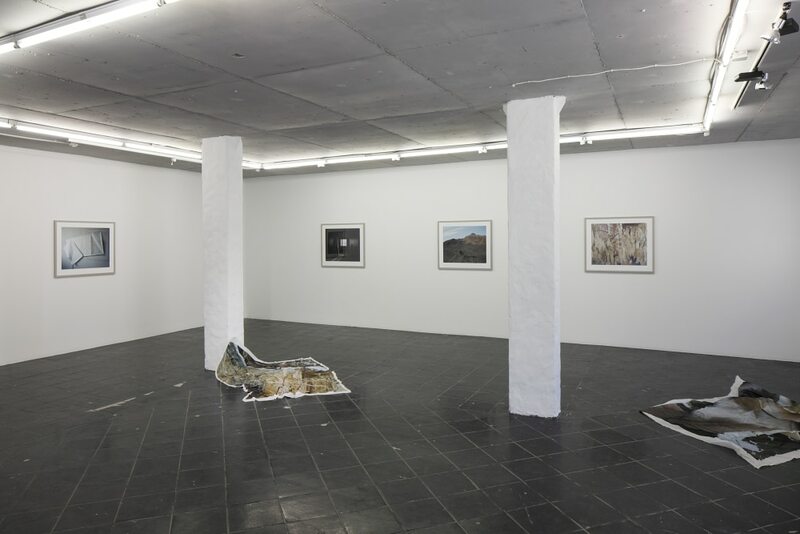 Group exhibitions: Le fragole del Baltico, Careof, Milano (2015); Ornamentalism. The Purvītis Prize, Arsenale, Venice (2015), 61st International Short Film Festival Oberhausen, International competition, Germany (2015); Bad Feminism, RPL Film Theatre, Regina, Canada (2015); 60th International Short Film Festival Oberhausen, International competition, Germany (2014). Upcoming shows: RITUALIA, Ename Actueel 2015, Provinciaal Archeologisch Museum (PAM), Ename, Belgium; participation in the 6th Moscow Biennale of Contemporary Art. Sarah Gerats, Kirils Šepeļevs, Aleksandrs Romanovskis, Jeļena Gņizdilova, Pjotrs Puceruks, Jekaterīna Puceruka. Miks Ramāns, Jānis Vēliņš, Ints Vikmanis, Dace Cīpola, Uldis Ozols, Edgars Spridzāns, Laimdota Steķe, Baiba Bīviņa, Vadims Mironovs, Karlīna Epnere, Lūcija Epnere, Andris Landaus, Klinta Roga.